So after a little bit of a false start and a size change, I am settling into running with my FiveFingers. While I waited for my size exchange to be sent back I had started a barefoot training program, so I had a couple of weeks of getting used to running without an elevated, cushion under my feet, and got my soles a bit toughened up. I’m sure that helped jump start in the Vibrams, which I think you definitely want to start with gradually if you are coming straight from shoes. So far I have done a couple of 2-3 mile runs on the dirt road near our cabin in the KSOs. But I LOVE them! For some reason, it is just a blast to be cruising along with almost nothing under your feet, feeling like it is really just your feet and legs moving you along. I went for a very easy 2 mile first (again, after much more gradual barefoot conditioning), and had no additional pains or soreness. So today I stepped up a bit and went 3 miles at a more moderate (vs. slow) pace. Again, no problems and the feel is fantastic. I definitely have to pay more attention to footing than with shoes, but I’m OK with that for now. The FiveFingers can handle small rocks (penny-size?) without any trouble. But I have landed on some larger rocks that I definitely noticed. But a forward-leaning running style and the immediate sensory feedback make it easier to shift weight quickly, and I haven’t had any ankle rolls or injuries. Based on my first miles I am still really excited about giving these a try. I’m just bummed that I’m starting right when the weather is about to turn. I’m interested to see how long I can continue running in these as the temperature drops. 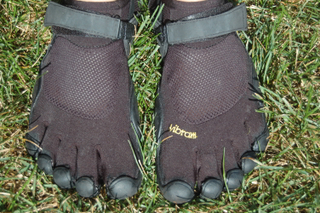 I am considering some additional cold weather options for a barefoot-like experience and will start testing those soon. This entry was posted on October 17, 2008 at 9:45 pm	and is filed under FiveFingers. You can follow any responses to this entry through the RSS 2.0 feed. You can leave a response, or trackback from your own site.